We Americans are privileged to live in a country that boasts the top scientific research in the world being conducted in our laboratories, research institutions and government establishments, like the National Institutes of Health (NIH). The United States is currently considered the leader in biomedical research, but what most Americans don’t realize is that our place at the top is shaky at best. With other countries, including China and Germany, increasing science funding and surpassing the number of U.S. college graduates in STEM fields, the distance between the top and second place is narrowing at a quick pace. The recently proposed federal budget further threatens to bring the U.S. toppling from its precarious position as the world leader in scientific research by slashing the NIH budget by a staggering 18 percent, eliminating of funding. As a graduate student at Johns Hopkins, it’s easy to believe that the rest of the population shares my sentiments that this is a detrimental and misguided proposal from the new president and his staff. But when I talk to people outside the biomedical sciences, I’m often confronted with the unfortunate truth — many people don’t understand science funding, how it works, why it matters or why their tax dollars should be spent on it. Investing in scientific research and being a world leader has many unrecognized benefits. America attracts top science students and professors from other countries, who come to our institutions to learn and conduct research — with foreign-born individuals representing 23 percent of scientists working in the United States in 2006. 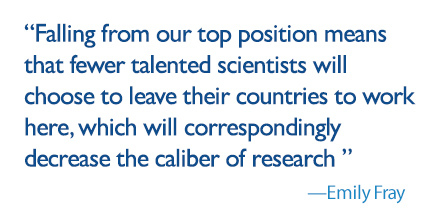 Falling from our top position means that fewer talented scientists will choose to leave their countries to work here, which will also decrease the caliber of research. Furthermore, when scientists from other countries compete with the U.S., there can be economic consequences. A recent example centers on concerns that a French company, Sanofi, will be given an exclusive license to patents for the Zika vaccine, which would allow the company to set a very steep price for Americans hoping to obtain it. Unfortunately, making the case for science funding can become inherently difficult when it comes to cut-and-dried decisions like setting the federal budget. Although the 1950s saw a surge in support for science funding, much of which was specifically allocated to “basic science” — scientific research that does not have immediately apparent medical applications — the new millennium and the exponential growth within the tech industry have resulted in a shift in public attitude toward one of impatience, accompanied by a desire for swifter returns and an increased pressure from funding sources to pursue scientific questions with clear clinical relevance. It can be frustrating from the public’s perspective to look at the seemingly immense NIH budget and feel that the money invested isn’t giving tangible, obvious results, but this is because science requires time, thought and planning, with significant advances often occurring at an incremental pace as new discoveries are made. For researchers, this emerging impatience with science can be equally frustrating, but it is important to remember that the scientific process is largely obscured from those not directly involved in it. Researchers and clinicians must find a way to convey that although the benefits of science funding are rarely concrete, this does not negate their importance and often leads to outcomes that are greater than could have been imagined at the start. Indeed, as Fareed Zakaria’s highlights in his 2009 Newsweek article, federal funding has led to “to the development of the internet, lasers, global positioning satellites, magnetic resonance imaging, DNA sequencing and hundreds of other technologies, an accomplishment that should be touted by researchers and better communicated to those outside of the research community. Therefore, although making the case for science requires convincing the taxpayer to invest in the future, it also requires the researcher to be more vocal about the value of this investment, especially during a time in which instant gratification is becoming increasingly valuable. Researchers must recognize that asking taxpayers to support science funding asks them for altruism, faith and respect for the scientific process, requests that may be met with more acceptance if they include demystifying scientific research. Convincing politicians and the general public that science has inherent value has to come from the people who best understand the intricacies of the process and must include better communication from the scientific community. Researchers, clinicians and science students can no longer be content to simply mingle with like-minded people within our field and need to strive to make a conscious effort to talk with people outside of science or medicine, while underscoring the importance of research and investing in the scientific process. Louis Pasteur once said, “Science knows no country because it is the light that illuminates the world,” and it is now the responsibility of all modern scientists to work fervently to make sure that that light cannot be extinguished.